Today’s post is a reminder of the power we truly have over darkness. I have two coaching clients who blew me away last week. One is actually a past client, still dear to me, and now my sister in Christ. The other is newer to the practice of truly uniting with the Trinity…’God partnered living’. Either way, they were both under attack last week. Now, you might be thinking this is all a little too much. And if that is you, just hang in here with me. Satan is real and I want us ALL to know how to keep him from bugging you!!! I have to start by sharing a coaching concept with you…PROBLEM-WORD-GIFT-CHOICE… Which is right out of my book, the foundation of my coaching practice, and these four words were spoken to me LOUD and clear, by our heavenly father, when I was setting up my business. God wanted me to share a system that would ignite folks to get back to the written Word, to Him, and into all the Trinity offers. If you’ve read my book, Awaking the Living Legacy, you’ll know of the creative way He helped me to find and step into this process. See I became a Director of Nursing at age 26 and I was clueless. When I was hired, the organization I worked for was under a massive transformation, of structure and leadership. What a blessing that was for me. I learned right from the get-go how to lead and to lead well. Don’t get me wrong, I was by no means perfect but leading others quickly became easy and it made complete sense to me. What I found hugely beneficial, was that it was more the process than myself that was providing success in leadership. Our family moved around a lot with my husbands work. And, as long as I took this awesome process, that’d I’d learned in my leadership training with me AND applied it…IT ALWAYS WORKED. God kept flashing this insight in front of me as I was trying to figure out a good process for helping others get God-partnered. He would show me past memories of nursing homes filled with trials, difficult employees, even negligence and deceit…If I held true to what was a great process…It never failed, it would reform that place. I learned that people wanted to do good. Even many of the natural born leaders in those facilities, doing really BAD STUFF often wanted to do good, and would go on to become some of the best leaders of the good I was holding them to. Most everyone wants to succeed, wants to be at peace, energized, and fulfilled. And when we are not…I truly believe it is simply because we aren’t being led in a way that will provide this. When we are struggling, even if you or a loved one is struggling in a big way…I want you (all of us) to know that there is a way to overcome this place. AND IT IS BY GETTING INTO THE HABIT OF USING A PROCESS THAT WORKS! So my process at work was to first get to know the people, the residents, and the staff. I needed to build trust and they needed to know what they could expect out of me. By this, we would begin to unite. They would begin to listen more, to better understand me, and hear what I had to say. After that, we would make known our mission, plan, rules, and standards. We couldn’t do this first. Complete chaos is what would happen if I’d simply plopped down a bunch of policies and demands before they knew, liked, or trusted me. Third, I needed to be clear about what was to come. This is just how people are. See, God knows it all- and we do not. It is hard to reach for greatness when we don’t know what that is, what it looks like, how we will get there, and if we are even able. We are just wired to be more invested if we know the benefit. I knew I needed to give them proof, to inspire them and help them to see how high performance would and could be achieved. Last, accountability. That’s so often what it all boils down to. WILL WE DO, WILL WE FOLLOW… OR NOT? NOW FOR HOW I USED THE PROCESS ABOVE FROM WORK… TO HELP OTHERS GET GOD-PARTNERED AND TO SUCCEED IN LIFE. 1. THE PROBLEM: Are we inviting God into our life, our problems as well as our joys? This is how we build a relationship with him. Are you seeking him, investing in him? Do you dare to trust Him early on as problems sets in or do you wait until you’re simply desperate, reaching out as an act of survival versus an earnest partnership? 2. THE WORD: Are you getting to the Bible? All the rules, tips, tools are there. And as that relationship with God grows the Bible will make more sense. You will trust it more, use it more, and understand it more because you know it’s creator. 3. THE GIFT: What’s in it for you, your loved ones, and God’s people if you follow it? Look for bible verses on ‘life matters’ as they arise, to find out how God wants you to respond and how acting in faith will benifit everyone. The Bible and God are not here to simply dictate to us what to do. God also wants to inspire us and teach us. We know all too well how the world rewards us for our effort, which can be cool for a season but those are often quick fixes that don’t sustain or fill. I want the fruit of the spirit for you. 4. THE CHOICE: Yeah, so just like my employee’s who were way more trusting, invested, and understanding to me as they came to know me…So it goes for us and God. They knew the rewards and discipline that would follow based on how well we carried out our plan. They knew I would help them, give them an extra shot if their heart was in the right place. I would make it my problem too…as a great leader you know their success is yours, their failures are yours. I would do what I could to teach a new way, connect in a way that matched who they were. God does this with us. Whether we want to admit it or not. The Bible (laws/rules/tools/encouragement/inspiration) is there to help us and the Trinity is with us to carry it out. BUT ULTIMATELY WE HAVE TO DECIDE… WILL WE USE THEM OR NOT? So finally, let me wrap this up. My client who’d been through coaching a couple years ago told me how stress-free her once crippled with anxiety life has been since she’s gotten really God-partnered. How rarely Satan knocks at her door these days. (doubt, anxiety, fear, insecurity, rage, or shame…) She said she is in such a pattern of stopping and recognizing when something wrong is trying to get in. She quickly turns to the written word for answers (do a bible verse search, listen to the word in worship and music, etc) and then she particularly looks for the effect- the assurance that she can lean on by following the Word. And last, she makes a choice. She said, as time has gone on the choices are getting easier and easier. She knows God and His Word- so tapping into his teaching and the Trinity is almost instantaneous. She said Satan only shows up now…for the big stuff. And she knows God enough now… to not be fooled. My newer client openly shared how she was in a funk. She was quite bothered by it and those old feelings of agitation, unsettling, and upset crept in. People were asking her if she was okay and this made it even harder to ignore. Graciously she shared this with me and I will share this with all you. This is just how Satan works. See, this woman is on a great path to freedom 😉 She came to me so heavy. Heavy by the world. This is often the case but, like all who dare to step into Jesus…He restores and brings life. My client quickly took to this healing and I’d noticed it was coming on very fast…faster than I thought my client was even aware of. I encouraged her to spend the next 2 weeks, between our sessions, to start becoming aware of how far she’d come….And to give God the glory for her place in all that. I knew recognizing God’s role in her growth would increase her faith even more. Honestly, she looked like a different woman between coaching session one and session four. LIFE, is what I now saw in her and an eagerness to learn and keep on this path. But, when we met two weeks later I knew immediately that there was a setback. I braced myself, wondering what had happened. She was so discouraged that she went back to old habits of turning inward, tension, and upset. It actually shook her faith rather than increased it. It broke my heart. It was like all the work we’d done was wiped away and it made me mad for her. I WAS MAD AT SATAN. Ha, my wonderful client, even me for a bit, got all wrapped up in WHAT had happened… instead of why… ‘THE PROBLEM’. Listen, Satan loves to pull us away from God. He wants us working for him just as God wants. Those who are metaphorically ready to take a full-time position with God…Are serious prey for Satan. Satan will use any area of our weakness to pull us away from this God and the call He has on our lives. So no wonder Satan was right there ready to get her off track when she was down. Especially with her being new to all this. But…GOD ALWAYS WINS… if we let Him. So I asked my friend. Did you use the 4 step process? And in an instant, her face changed. She said ‘no’ looking up thoughtfully. And then relief came over her…God had not abandoned her. The recent changes for the positive in her life were not a short term dream. She simply got caught up in the antics of Satan…and when that happened, she forgot to use the process that works. First figure out the true problem/heartache/difficulty…then turn to the Word, then look at the benefits if you follow what God’s asking/teaching in the Word and last, decide to step out in blind faith. I helped my friend know that it was huge that she came to understand all this…she’s a quick study. Once she realized that she had a way to fight this sort of attack next time, her whole demeanor changed. She got convicted to no longer be prey to Satan. To immediately recognize when she feels off…to go to the Bible for help and to step in with blind faith. My two friends are God-partnered…Satan will always be lurking around but we do not need to dance with him. We have the almighty, the all-powerful. Today’s post is a simple reminder stay God partnered and to use a process that works. 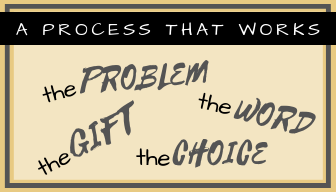 CONSIDER THE PROBLEM, THE WORD, THE GIFT, AND THE CHOICE.